Medieval romances--stories of knights and their ladies--were written for courtly audiences which were largely female. Translated into English from French, the 'Romance of the Three King's Sons' has as its main characters three young princes who venture off to battle the Turks: Philip of France, Humphrey of England and David of Scotland. While the story concerns their campaigns and travels, much female input comes from characters such as Iolante of Sicily, and the entertaining plot has intrigue and some twists and turns. This illustrated manuscript of it was probably made in London, from the evidence of its London and Midlands flavoured Middle English and similarities with another manuscript. It is not known whether it was made to order for a particular person or speculatively for sale. Its numerous pictures, unlike earlier medieval illustrations on the whole, may have been 'invented' or adapted from illustrations of other stories, as no other copy of the story survives with such extensive illustration. 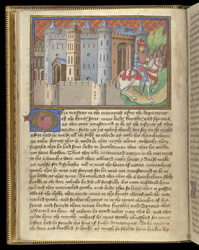 One of four half-page pictures in the manuscript, this scene shows the royal palace in Paris with, in the lower corner, Prince Philip riding away alone. He has started his journey to aid the King of Sicily, who is being threatened by the forces of the Grand Turk. The picture implies the story ahead and tantalises by showing the idealised young prince looking toward his mission in the pages that follow.